Everyone has files that are important to them and it would be a disaster if they were lost. Years’ worth of pictures from graduations, kids growing up, and even items like tax returns or import documents that have been scanned for digital file storage. Keeping digital files can make it easier to store, as well as search for later. The problem is, what happens if your hard drive crashes and you lose everything? A good backup plan is something that most people tend to forget about. Many people will backup pictures and documents to one main hard drive and believe that is good enough. What happens if that drive dies? I had a colleague bring me the external hard drive where she had kept all the pictures of her children growing up. The drive had crashed and after looking at it, I had to let her know there was nothing I could do to retrieve the files. The drive was dead. She lost years of pictures. She was under the impression that it was on an external drive and that was good enough. The truth of the matter is, you can never have too many backups. Cloud storage programs such as Drop Box, One Drive and Google Drive are great places to store files, but you need to keep them stored somewhere else as well. For me , I keep my son’s pictures on my laptop and backed up to my Microsoft One Drive account. Then from time-to-time I will run a backup of those photos to my external hard drive that I keep connected to my wireless router. This way the pictures and important files are kept on my laptop, in my One Drive cloud storage and also on an external hard drive. These pictures are so important to me, I will probably even back them up a fourth time to something like DVD. 1 – Off-site backup – This means using a cloud storage option such as Carbonite or Crash Plan. Crash Plan and Carbonite are topics in of themselves, but these are great programs to back up larger amounts of data. With programs like One Drive and Drop Box, you tend to get one folder that is backed up. With Crash Plan and Carbonite, you can back up your entire computer if necessary. Look for upcoming posts about Crash Plan and Carbonite where I will explain exactly how they work and why they are a good choice. In the meantime make sure you backup your important data by no less than the Backup 3-2-1- Rule. As always, we welcome your opinion and questions. 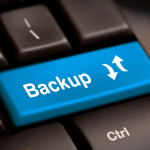 Do you have a data backup plan in place? How are you keeping your files and precious memories safe?